This precarious but delightful goblet (is it the chalice from the palace, or the vessel with the pestle?) 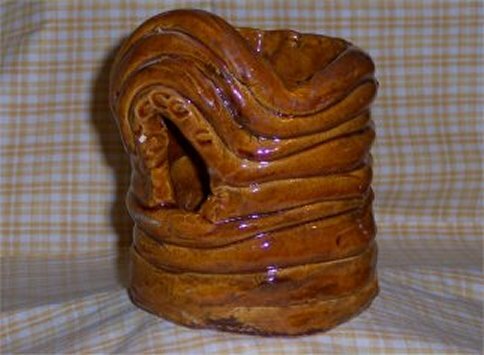 is formed from two pieces: a rolled-out flat circle formed into the cup, and then a columnar tube that’s been smushed at the bottom to form the base. Not surprisingly, it tipped over while I was standing at the checkout station at the thrift store. The woman running the place was very apologetic, and gave it to me for free. 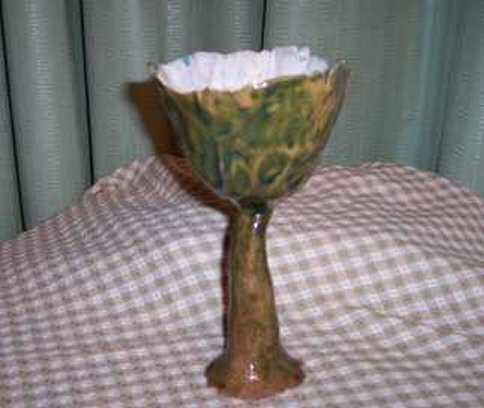 It stands about 9 inches tall and the cup is about 4 inches in diameter. Sadly, although this piece survived its tip-over at the checkout stand, it did not survive the Flood of 2008. This hefty kid-made roll-method piece has a beautiful deep brown glaze and measures just over 5 inches tall and 4 inches across. 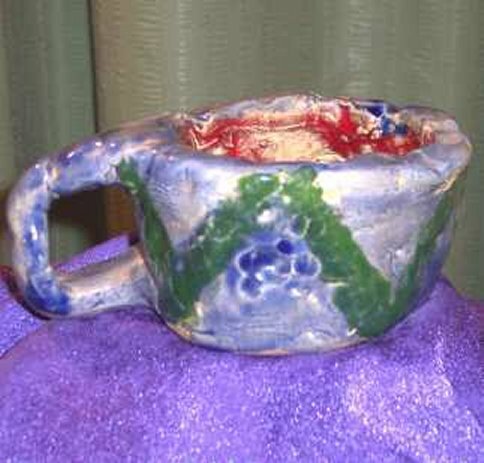 It’d be easy to call it a pencil cup, but in fact it really defies characterization as there’s a very purposeful slot in the wall of the tallest side which suggests it could be a wall pocket, or possibly a coffee mug gone astray. It is marked “124 Kena West” on the bottom.